North Point Lighthouse’ garden and grounds are coordinated with its restoration in keeping with its history and the Frederick Law Olmsted historic design of Lake Park. Landscape Architect and Olmsted scholar Margarete Harvey carefully selected indigenous foundation plantings that were historic to the early 1900’s, in keeping with the era designated for the restoration of the Keeper’s Quarters. Shortly after our 2007 rededication, a small group of amateur gardeners led by volunteer Anya Grahn helped maintain the grounds and forged a Victorian Kitchen Garden to the southwest corner of the Quarters with pavers reclaimed from an 1893 Milwaukee rail road spur track. 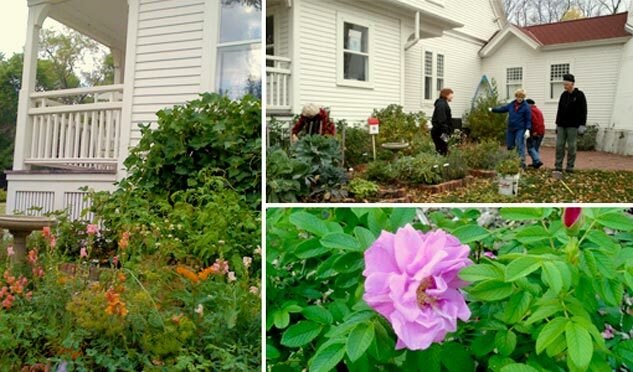 In 2010, Ms. Grahn recruited the help of Master Gardeners of Southeast Wisconsin. Under the guidance of Marlene Jaglinksi, the Master Gardeners have designated the North Point Lighthouse gardens as their only East Side site for their gardeners to maintain their Master’s status and provided a grant for materials needed for its upkeep. Native plant specialist and head of Lake Park Friends’ Historical Plants Committee provides a guiding force for the garden and extended grounds and is the main tender for the Victorian Kitchen Garden. Milwaukee County Parks maintains the lawns and surrounding areas, including the Cannonade. Garden enthusiasts and gardeners who would like to contribute or help may contact us at keeper@northpointlighthouse.org.